With the year ending, Jailbreak for iOS 7 has been released as an early Christmas present. This jailbreak allows the users of iPhone, iPad and iPod touch running latest operating system to install applications and games from sources other than the official App Store. Evasi0n, the team who has been behind the previous jailbreaks of Apple’s operating system has struck again. This time, they provided us the jailbreak for iOS 7 just 94 days after the release of the iOS 7. 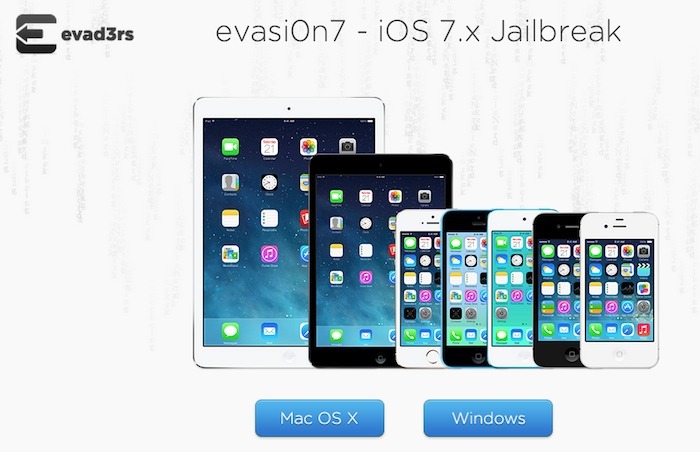 According to Evasi0n, this jailbreak is compatible with all devices running iOS 7.0 up to 7.0.4 which also include the latest iPad Air, iPhone 5S, iPhone 5C and iPad mini 2. The process of jailbreaking an iOS 7 device is simple and straightforward. This is an untethered jailbreak, which means the process only needs to be done once. It can be done from a computer running either Microsoft Windows or Mac OS X as operating system. According to sources, after jailbreak users get access to two new app stores an App Store known as Cydia and a secret Chinese App Store Taig, which is known for selling pirated apps. There are conflicting views regarding the Chinese app as some users consider jailbreak ethical but not piracy. Evasi0n gain popularity with the release of jailbreak for iOS 6. It took Evasi0n 138 days to jailbreak the latest iOS at the time. Exploits used to jailbreak the iOS 6 were patched by Apple with regular updates. After the update of iOS 6.1.3 the jailbreak scene was over. By finding a new exploit in iOS 7 Evasi0n were able to bring jailbreaking back to life. Previously, rumours were there that the Evasi0n team is working on iOS 6.1.3 jailbreak but they abandoned the project when iOS 7 was released. Since Evasi0n released the iOS 7 Jailbreak in just 94 days, it is could be buggy and the users might face problems. According to sources, Evasi0n has identified that there are compatibility issues with Cydia app in iOS 7 which is also being reported by users. Early releases are bound to have some unsolved problems but there is nothing which can’t be fixed with an update by Evasi0n.